Arcam SR250 review | What Hi-Fi? If you like kit to fit into neat product categories, Arcam’s new SR250 is likely to cause upset. It’s either a stereo amplifier with video switching capabilities or an AV amp that’s running several channels short. In terms of features the SR250 has everything you would expect from an upmarket AV product (bar the number of power amp channels, of course). There are no less than seven HDMI inputs, all fully capable of handling 4K, HDR signals. These are ably backed-up with a decent array of digital and line-level analogue inputs. 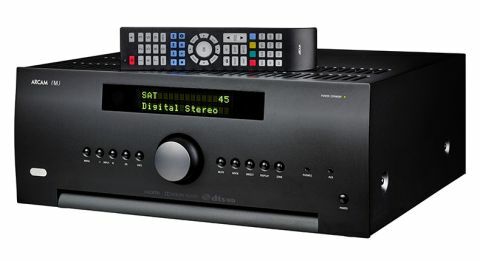 It would be nice to have a Type B USB to make a digital connection to a computer easier, but beyond that, we doubt there’s a stereo set-up where this Arcam will be found wanting. Initial set-up is the same as for any AV amp, though Arcam is particularly proud of the Dirac room equalisation system built into the product. This not only aims to minimise any room issues, but also optimises the phase performance of your speakers. Their tonal balance can be tuned to taste, too. While the SR250 comes with a suitable microphone you’ll still need to use a computer to do the processing. The relevant software (Mac and PC) can be downloaded from Arcam’s website. It’s not a difficult process, but we would still recommend getting the supplying dealer to perform the set-up. It might cost you a bit extra on top of the hefty price, but it’s well worth going to the effort, because the Dirac system is one of the more convincing we’ve come across. Comparing the sound of the SR250 with and without Dirac is interesting, and easily done with just a press of a button on the remote. There’s no doubt that the EQ makes our reference system sound more tonally even and notably better in terms of precision and focus. Detail levels are improved too, with low level instrumental strands becoming easier to follow. It’s not totally positive news though. Dirac neutered dynamic expression a touch, making the music a little less exciting and less fluid. That said, our test room is a relatively balanced proposition, so makes less of the advantages of the EQ system than others. If your listening space has some sonic issues we think Dirac would help, though we would stop just short of calling it essential. The SR250 is a hefty unit. Weighing in at a chunky 15kg, the casework mirrors that of Arcam’s current integrated multichannel amplifiers. It’s a well-built case too, feeling rigid and nicely finished. By AV standards, the front panel is a model of simplicity, and it’s easy to operate thanks to the well laid out control buttons and clear display. This is a pricey amplifier and feels like it. If you don’t want to use the standard remote, Arcam also has a dedicated iOS app that covers the full range of the amp’s functionality. Once loaded the app is simple and easy to use. Inside, you’ll find Arcam’s Class G power amplification, a complex circuit configuration that aims to deliver high-quality sound with low power consumption – pretty much the holy grail of amplifier design. The complexity comes from the use of multiple power supplies that are switched into use depending on the demands of the signal and output requirements. The SR250 is claimed to deliver 90W per channel, with just over 20W of that in Class A. By the standards of premium stereo amplifiers, 90W isn’t particularly striking, but listen to this amplifier in full flow and there’s no denying its muscularity. This amp doesn’t run particularly hot either. That’s not a big surprise considering the use of Class G technology and the fact that the SR250’s casework has so obviously been designed with the cooling requirements of the company’s top-end multi-channel amplifiers in mind. At first we weren’t sure how to approach this product. Music or movies? Arcam sees this product as a music device first and foremost, with the surround sound decoding and video switching capabilities additional and quite significant bonuses. We like the SR250 once it’s up and running. We start by using the analogue outputs from our resident Naim NDS/555PS streamer. The SR250’s sound through the line stages is good, nicely detailed with plenty in the way of body and punch. Prince’s 1999 comes through with a pleasing amount of insight and plenty of energy. It’s an articulate presentation with a good degree of clarity and precision. We would like a bit more in the way of rhythmic skill and greater emphasis put on low-level dynamic shifts, such as those that convey emotions in a voice, but even so we enjoy what we hear. We notice clear evidence of Arcam’s Class G family sound here – the presentation is big, bold and powerful, but mixed with plenty in the way of refinement. You could listen to this amplifier for hours on end without issue. That’s a good thing with recordings that are as thin and edgy as this Prince track. The digital inputs turn out to be similarly capable. The on-board digital-to-analogue circuit is talented, with the SR250 turning out a stirring rendition of Tchaikovsky’s Marché Slave Op.31. There’s plenty of scale here, and we have no reason to question the Arcam’s authority or its ability to deliver wide-ranging dynamic swings. Crescendos hit with venom, yet at any half reasonable volume the amplifier stays composed. Stereo imaging is crisp and layered with care, particularly when the Dirac EQ is switched in. Changing to movie soundtracks – old favourites such as Star Trek and Michael Jackson’s This Is It get an outing – shows off the SR250’s considerable talent. There’s plenty to appeal here from the amplifier’s punch and authority to the pleasing insight it provides. Action scenes from Star Trek brim with energy while there’s enough muscle to satisfy. Similarly, concert scenes from MJ are delivered with plenty of atmosphere and cohesion that few multichannel amplifiers ­– outside of some very high-end processor /power amp combinations that is – can match. The SR250 even has subwoofer outputs if you want to add extra low-end heft to the sound of your stereo speakers. Just to be clear, there are, of course, no surround channels and no preamp outputs that allow the connection of a separate power amplifier to allow them to be separated. This is very much a stereo-only unit, despite the home cinema processing at its disposal. This is a hard product to sum-up. The SR250 could be all the amplifier you ever need. If you’ve got a stereo set-up for your TV then it’s a neat way to get the features you need in one, convenient box. By stereo standards it’s a good sounding product rather than a great one, but if you need video switching then there’s little out there that will do the job better.